The KEMAR head and torso simulator was introduced by Knowles in 1972 and quickly became the industry standard for hearing-aid manufacturers and research audiologists (visit KEMAR.us to read the full story). It is based on worldwide average human male and female head and torso dimensions. It meets the requirements of ANSI S3.36/ASA58-2012 and IEC 60318-7:2011. 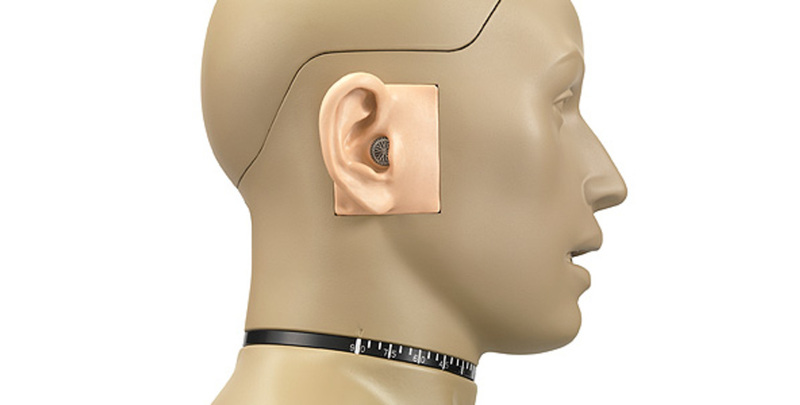 The GRAS 45BB KEMAR Head and Torso has the same dimensions and acoustical properties as the original KEMAR, but has been developed further by GRAS to meet the industry’s demand for realistic measurements of hearing aids, headphones and headsets. It provides acoustic diffraction similar to that encountered around the median human head and torso, both in the proximity and in the far field. As all the preconfigured 45BB KEMARs consist of the same basic 45BB KEMAR Non-configured, plus a set of application specific accessories, the full information about a given KEMAR configuration is obtained by combining the information about the 45BB KEMAR Non-configured and the information for a given configured version as found in the present text. Read about the non-configured KEMAR here. The 45BB-3 is a KEMAR head and torso for 2-channel sound quality recording, with externally polarized ½” pressure microphones. It is delivered fully configured, individually calibrated and ready for use. In addition to a system calibration certificate, a USB flash memory with simulation data is included. The main configuration specific components of the 45BB-3 are the GRAS 40AG ½” pressure microphones and the KB0090/KB0091 large tapered (VA-style) pinnae. The 40AG is an IEC 61094 WS2P ½" externally polarized pressure microphone with rear-venting. It is a high-precision condenser microphone made according to IEC 61094-4. It is extremely robust and reliable and can measure sound pressure levels up to 160 dB within 3.15 Hz to 20 kHz. Read more about 40AG here. The KB0090 and KB0091 are large VA-style pinnae. The hardness is 55 Shore 00 and they comply with IEC 60318-7. Other accessories for this configuration are listed in the Ordering Info tab. KEMAR Retrofit Kit for Anthropometric Concha and Canal Pinna.